Top placing competitors will go down only five places, so ties will receive the same reward. So, if two people tie for first, they will both get five favorites and a follow. More than two in a tie may result in a tiebreaker. I hope to see some awesome cards for this contest, and I wish good luck to all participating! I like the ability, but people will always go for the ability because it's a reduced casting cost. Making flash all but useless on the green card (which is off color if I remember correctly.) Maybe do something like "You may pay 4uuu and play this anytime you can play a sorcery, if you, lose X life" or something similar. You have an idea that is good, just needs some refining. Thanks @Tomigon, I appreciate the suggestion and I'll change the wording. @Bowler218 I appreciate your suggestion too but I'd still like to keep it as is. The cards are changed for the new wording too. I am trying make sense of what this ability really gets you. What is the hook that makes it work. May be your examples just don't sell me on it. The yeti is only one mana less, but you can't flash it in. Like okay, I guess, as such a bland option pool. I get not everything needs be earth shattering impact to the game, but this doesn't scream It's UNBOUND! when it's played. Like oh one mana cheaper. 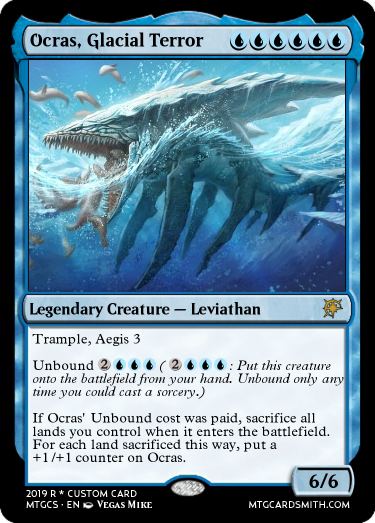 The Leviathan is such a stupidly expensive creature, no one is ever hard casting it outside of limited play. 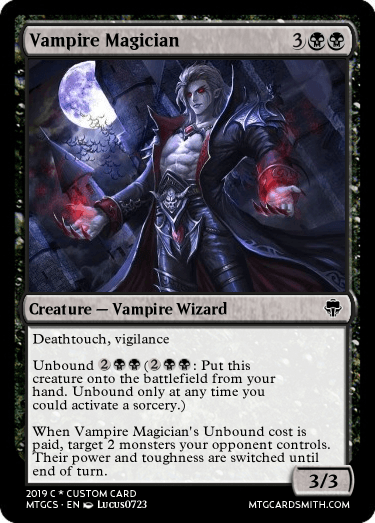 The Unbound doesn't reduce the cost enough to make that a remotely appealing choice. I still need be casting it on turn 7, and am losing all my lands. It's all or nothing there. If it cost 5-6 people might think about it, but at 7 it's high and slow of a creature. People would just assume play something that they could actually cast in a reasonable time table without hindering themselves. 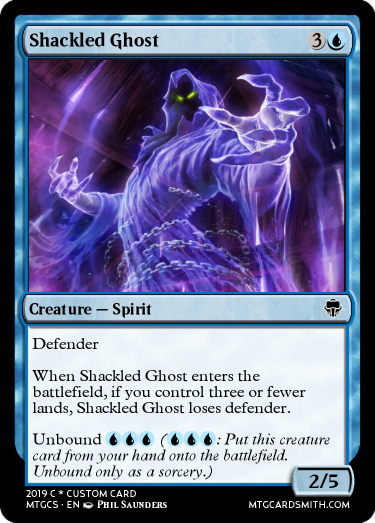 As someone who plays Ghalta in standard, 10/10 or bigger creatures still die. 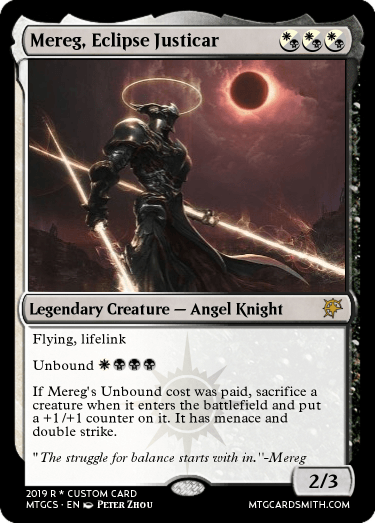 Playing it for it's unbound cost is too high risk , not enough reward. Creatures are set lose, but forgo blocking. Like a dog you let off the leash, you can't get them to come back, as they are free do as they please. This thematicly makes sense. It's not a great mechanic, but I can get what they are going for. So Why is it called Unbound? These examples do not give me sense of that, as just feels like generic alternative cost ability. 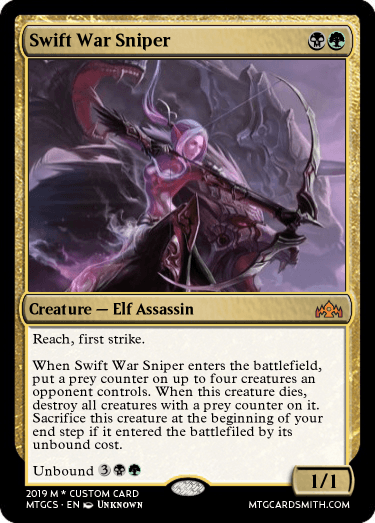 The examples do not give a sense of what this mechanic wants to be, or capture that ability's name. There's no consistency between them. Between simply having the proper lvl of impact to gameplay and flavor it doesn't do either for me. 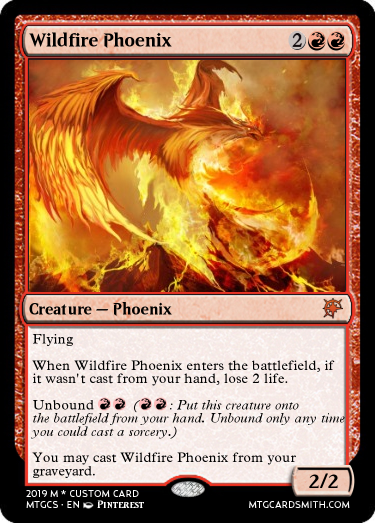 As someone who puts a ton of thought into what names I pick for my mechanics, and what those words mean I don't feel like that was the case here. Am I being too harsh?...May be, but I would be putting myself thru same paces if this were my cards. I would want to redefine this mechanic it having a more clear identity. Does mean I am not going make cards for this? Actually I probably will, as I see something that doesn't work for me, I make it a point to reconcile it into something that fits. I will see what I can come up with. 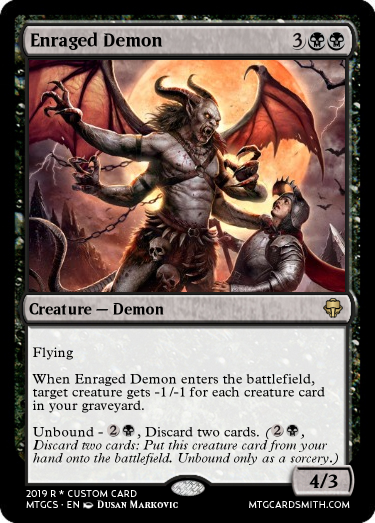 Unbound feels like a mechanic with potential, but it currently reads as a spite/salt mechanic from playing against someone with too many counterspells. 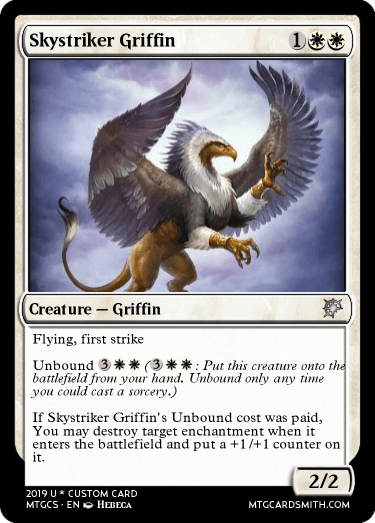 Saying you cast it for its unbound cost will help keep things even and justify lower costs. 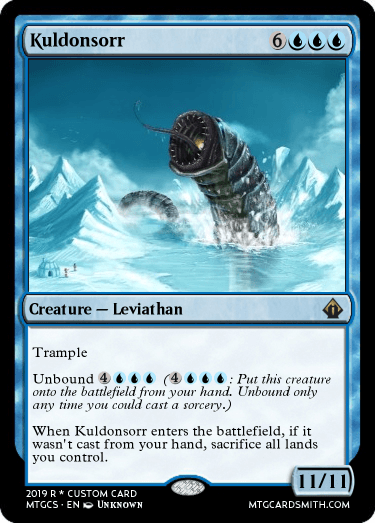 So wait, we're allowed to make an Unbound card and then just post it here? Anyways how do I post my card? Due to a number of entries not sufficient to judge I'm extending the deadline of this contest to February 22nd.